The Hampton Nautical Premium Quality 25" Brass Spy Glass Telescope is a great gift for a nautical navigator in your family. The spy glass measures 25" when its four brass tubes, which are clear coated to protect the brass from tarnishing, are fully extended. The spy glass is 9" when collapsed and features a smooth, solid wooden handle and a solid brass cap to protect the lens. Simply push in or pull out the eyepiece to bring the image into clear focus. 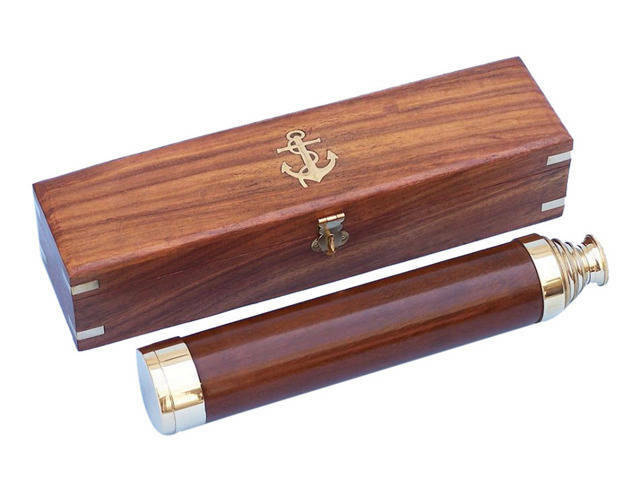 The 25" spy glass is shipped in a beautiful felt-lined brass-inlaid hardwood case. The box features brass side inlets on all sides and the Hampton Nautical solid brass anchor-with-rope logo on the top. The box is smooth, gloss-finished hardwood measuring 9.5" wide, with a solid brass front clasp. Board your yacht for a fabulous sail across the warm ocean, the crisp, salty splash of the sea spraying across the decks, and make use of your antique nautical telescope to guide your way. As you glide through the surf, plot your course with this brass nautical telescope as sailors have for centuries, studying the stars and coasts and charting your own map. 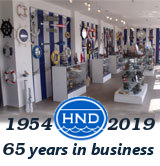 Purchase telescopes from our wonderful nautical catalogue, each antique nautical telescope crafted to historic standards from solid brass that will stand the test of time even on the high seas. Imagine the amazing time you will have as master and captain of your own ship, the warm sun shining down on your vessel as it cuts across the ocean, and with your antique nautical telescope truly command your destiny.